(l-r) The cast of 'Little Gem': Eimear Smyth, Doris Cullen and Lisa Walsh. Three Dublin women, from three generations, Kay (grandmother), Loraine (mother) and Amber (granddaughter) take the audience on an emotional roller-coaster ride as they narrate how they navigate ups and downs over many months. Elaine Murphy’s play unfolds in alternating monologues, as three generations of Irish women greet life’s travails with strength, humour and the occasional vodka and Diet Coke, or night of abandon on the salsa dance floor. Members of Balally Players were delighted to present this poignant and funny piece of theatre, a tribute to the resilient spirit of woman. 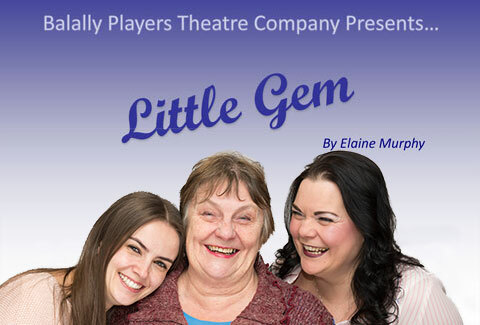 'Little Gem' has won a number of awards including the Stewart Parker Award for playwright Elaine Murphy and the Carol Tambor Best of Edinburgh Fringe award. While each production of the play brings new voices to the grandmother, mother and daughter three-hander, audiences always enjoy the humanity and humour of the writing. 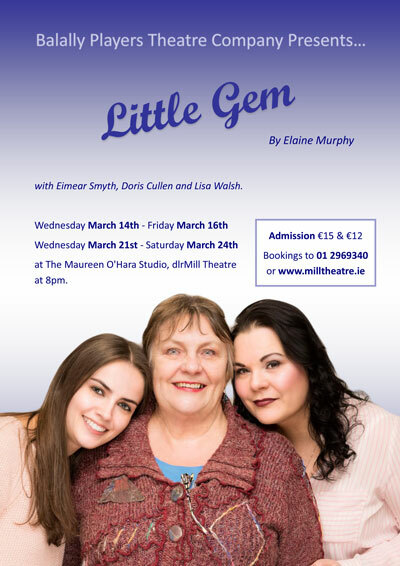 Karen Carlton directed Eimear Smyth, Doris Cullen and Lisa Walsh in this award-winnig play by Elaine Murphy. The performances were at 8pm each evening in the Maureen O'Hara Studio at dlr Mill Theatre, Dundrum.